Joan McDonald is the National Recurve Coach for Canada’s Archery Team and is heading to her 6th Olympic Games as a coach. Now at 73 and having been a competitive athlete herself, Joan has a wealth of knowledge and experience in elite sport. 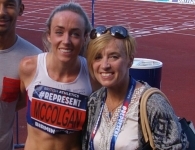 Joan shares with our Olympic Reporter Andrea, the lessons she has learnt along the way and why she thinks there are a lack of women coaching in the elite levels of sport.